On October 4, 2017, the El Dorado County Office of Education and the Association of California School Administrators (ACSA El Dorado Charter) hosted the 2017 Community-Based Organization “Sharing of Services” Breakfast. This event provided an exciting opportunity for nonprofit and educational teams to network, learn about services provided by each organization, and strengthen the crucial partnerships that benefit our community. As guests entered the building and enjoyed breakfast, a photo show was displayed on a large screen to capture highlights of many of the organizations’ activities. Dr. Ed Manansala, El Dorado County Superintendent of Schools, moderated the event. After enjoying breakfast, each organization presented a 60-second “infomercial” about their organization and current projects. After the presentations, guests were encouraged to connect with others in the room and become inspired by mutual passions. Organization-specific materials were also available to all. 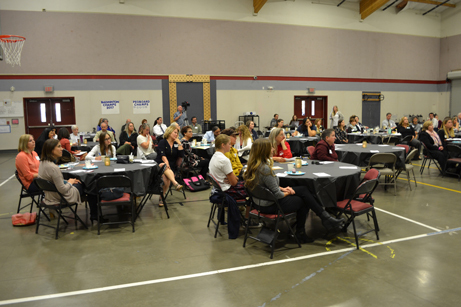 The breakfast provided a unique opportunity to encourage communication and networking throughout the County, enabling everyone to provide more comprehensive services to the residents of El Dorado County.